If you already heard about easy and complicated counting strategy here we introduce you the middle card counting strategy which you will easy understand and using which you will benefit. If the basic strategies assign cards values of 1 point or zero, and the most complicated assign up to 10 points, the Zen Count strategy assigns card value up to 2 points. Also, if strategies as Hi Opt 1 and Hi Opt 2 ignore Aces, by assigning them as zero, and force players to count aces separately, the Zen Count consider Ace as a valuable card in the game. 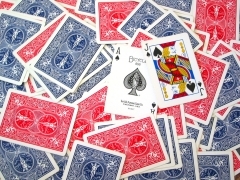 It is valuable, since Ace can be counted as 11, and only with an Ace and any other high valued card from the deck there can be a blackjack. If you start thinking the strategy is quite hard to understand you can just give up and start playing slots online right now. But, we would like to advise you to stay with us and guess what is what. So, let’s move on. The Zen Count system became popular after Arnold Snyder’s book “Blackbelt in Blackjack”. Author describes Zen count strategy in every detail and explains the usage of it, so if you want to get a closer look on the system this book is the first to read for you. Zen counting is not an easy strategy, but not even close to be called complicated, so even beginners can learn how to use it pretty fast. Cards 2,3 and 7 should be counted as +1. 8’s and 9’ are counted as 0. Zen count strategy is a balanced card counting strategy, which is mean that count begins from a zero and ends up with a zero. By assigning -2 to an ace Zen Count makes counting a lot easier than most of other counting systems, which give Aces no assigned points. It means that you don’t need to count Aces separately, which removes unneeded distraction on a side counting. At the same time it makes the counting with Zen Count more precise. As always there is a small problem – because Zen count is a balanced system, it is best suited for single deck blackjack tables. If there is a multiply deck blackjack table, and all land casinos have only multiple deck tables, you will need to count both the running count and the true count while playing. To calculate the running count, you will need to divide true count from your head on the number of decks on the table. Probably it could be figuratively compared with a situation when a casino has only slots for US players, but not people from other countries. Then they need to divide visitors into few groups. Same as with most of the counting strategies in Zen count when your count is a big positive number you need to increase your bets, because it means that there are more high valued cards left in the deck, and it is great for you. The bigger the number you have in your head, the better it is. Same time, if the number in your head is a big negative number – be careful and don’t make big bets, it is a big possibility of losing. Please remember that all counting cards operations while playing should be in your head, you cannot write them down! Casinos don’t like counters, and as soon as one has been spotted, this counter will be thrown away from the casino! The main thing you need always remember with any card counting strategy, is that card counting is only a positive asset to the blackjack strategy! Before beginning to count cards, you need to master the strategy of the game.